Boca Greens Country Club is a premier family oriented community, established in 1983, located on State Road 7 (US 441) north of Glades Road in Boca Raton, Florida. Boca Greens features a luxurious Clubhouse, fitness center, and pool. The community is gated and secure. There are 586 single-family homes and villas in Boca Greens ranging from 1,800 to 3,000 square feet. Boca Greens is a year-round community where residents can enjoy an 18-hole golf course and placid lakes provide exceptional views for the majority of homes. 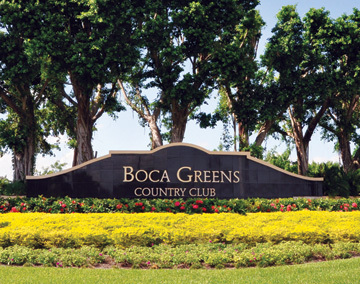 Memberships at Boca Greens Country Club include Golf, Tennis and Social memberships. At Mizner Grande Realty we pride ourselves in representing Boca Raton's best neighborhoods. Contact us today for a private tour of the area's newest homes for sale.